← What’s the opposite of a bubble? I feel compelled to say now, this whole story has been quite firmly proven to be incorrect. It was a case of bad science on the part of the investigators in question, and good science on the part of everyone else who picked their theories apart and propery tested them. They were wrong. That’s not a misfortune, that’s science. I’m leaving the story here for completeness, but just to warn you before I start – take it all with a hefty pinch of salt. 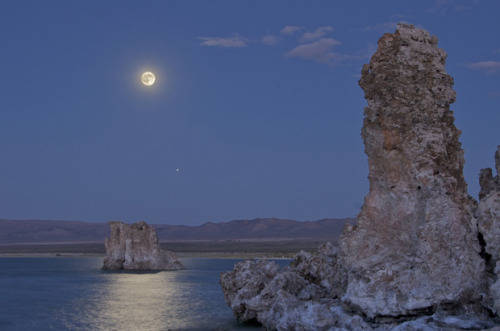 Mono Lake, in California (of all places) certainly looks alien. Curious rocky spires rise out of water enriched with unusual metals. Metals which are quite toxic to life as we might know it. So, as the catchphrase goes, what about life as we don’t know it? After a much hyped NASA press conference,* the discovery was announced that a form of bacteria has been discovered in a lake in America which technically doesn’t need to use DNA. Technically. The “required” elements for life are usually termed CHNOPS, for carbon hydrogen, nitrogen, oxygen, phosphorus and sulfur. 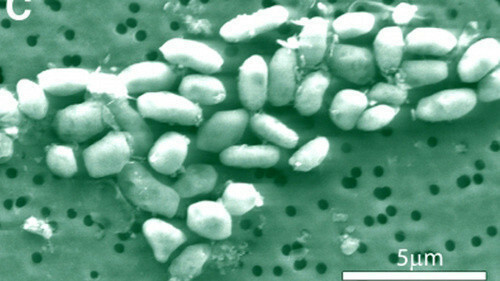 But These unusual little bacteria apparently don’t need one of those. Specifically, they can quite happily live without phosphorus. Now, phosphorus is pretty essential to us regular Earth life forms. The DNA that encodes everything we are is held together by a sugar phosphate backbone. For every letter of genetic code, in every last DNA (or RNA) molecule in your body, there’s an atom of phosphorus. But the bacteria discovered in Mono Lake don’t actually need it. These bacteria live in water enriched with arsenic, amongst other metals. Despite the fact that arsenic is quite deadly poisonous to us, these bacteria don’t even bat an eyelid. Or… they wouldn’t, if bacteria had eyelids. Remarkably, these innovative little microbes happily take in the arsenic and use it in place of phosphorus! In the strictest definition, DNA requires a kind of molecular backbone made up of the sugar, deoxyribose, and phosphate. This sugar phosphate backbone is what holds the DNA molecules together, giving them that characteristic double helix structure that we all know and love. Therefore, technically, if the molecules use arsenic in place of phosphorus (in other words, if it has a sugar arsenate backbone**), then it isn’t really DNA. It’s an analog using a heavier atom, but technically, we have discovered life which doesn’t use DNA. And that has massive implications. Arsenic can be thought of as the big brother of phosphorus. It’s a heavier atom, but it sits in the same column of the periodic table, meaning that the two have very similar chemistry. Actually, nitrogen is in this group too, and it also shares certain characteristics. Every column in the periodic table has certain shared properties. It’s the same way that carbon is in the same group as silicon, and so the two share certain characteristics. *** So could other heavier elements substitute the more familiar lighter ones? Could sulfur be replaced by selenium? Perhaps silicon really could act as a surrogate for carbon in the right place. I still contend that the Horta, sadly, can’t exist. But the idea of life using silicon in a more central role certainly can’t be ruled out, especially in light of this. Perhaps somewhere else, life’s nucleic acid is using a sugar silicate backbone instead. The overwhelmingly open question is that if phosphorus can be switched so easily with arsenic, then what other parts of life’s chemical machinery can be mixed and matched? Perhaps bizarrely, this isn’t the first time I’ve found myself wondering about this. A different sugar, instead of deoxyribose? Different nucleobases, instead of adenine, uracil, et al? Perhaps sulfur could find its way in, with thiouracil replacing uracil? In sulfur rich environments like those found elsewhere in the solar system, it certainly seems possible. If there’s only one real thing to be learned from the bacteria in Lake Mono, it’s this. Life is inventive. Life uses what it’s given. This one thing we see all across the planet. Life elsewhere would likely make the best use of what it has available, and if what it has available is not the same as that which we find on Earth, then we cannot expect it to work the same way that life does on Earth. * Every time NASA does this, lots of people go a bit crazy expecting them to announce the discovery of alien life. If I’m perfectly honest, I’m one of them. The trouble is that lots of people end up feeling let down when they don’t announce extraterrestrials. Come on, people. Good coffee is still good coffee, even if it isn’t Blue Mountain. If you see what I mean. *** Actually, lead is in the same group as carbon too. Like all group 14 elements, it can form 4 bonds. Being as an old fashioned name for nanotubes is “zeppelenes”, this led me once to muse on the idea that a hypothetical molecule must exist, called a lead zeppelene. I wrote this in a school report. I was a strange kid. This entry was posted in astrobiology, chemistry, Imported from Livejournal and tagged biology. Bookmark the permalink.